When it comes to any big brand, marketing and media play an important role. Poker Media is a massive industry and advertising budgets seem to be never-ending. In a world of social media and interaction, advertising and getting your brand noticed has never been more important. Let's take a look at how some of the big name poker brands are using the media and advertising to their benefit. Caesars Interactive Entertainment: In an ad blitz for their World Series of Poker site, WSOP, they ran a series of advertising campaigns that included TV, radio, print and digital. The ads were aimed at promoting online poker and emphasized the "whenever", "wherever" availability of online gaming. In one of their TV ads we saw a man struggling to conceal his "tell" and then we see him playing from home and saying, "online I don't need a poker face." One of their radio advertisements played on the idea of winning "real money in my undies" and also using the phrase "a flush while I flush". Again the emphasis was on playing online poker games from home. 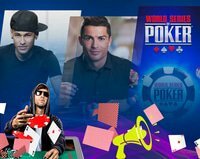 PokerStars: Two of the world's most popular footballers are to be the main attraction in a brand new Facebook advertising campaign by this poker brand. Cristiano Ronaldo and Neymar Jr. will both appear in videos that show them playing online poker around the world. This is to be the biggest PokerStars marketing campaign and it will launch with exclusive distribution on the social networking site Facebook. These ads will eventually air on television. PokerStars have also used tennis champ Rafael Nadal in their new mobile ad campaign. 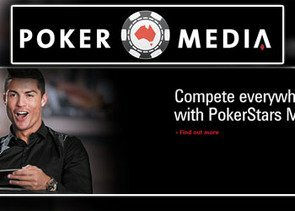 That's not all this company has done to promote their online poker games. They partnered with Sizmek, and MediaMath to launch an innovative real-time campaign to promote their European Poker Tour. The event is to be streamed live and at the final table of just eight players, the video will show the players' cards so that viewers can get an inside look at each of the player's strategies. Californians for Responsible iPoker (CRI): A new ad campaign shows regulated online poker as being the antidote to unscrupulous offshore operators and calls on voters to ask legislators to support regulation. CRI is backed by a coalition that includes Amaya/PokerStars and will include web display ads and radio spots. Full Tilt: Another very prominent brand in the online poker industry, they are launching a new and different advertising campaign that will focus on sharing player experiences. This is in line with their new policy that focuses on the thrill and excitement players get from playing poker online as well as casino games and slots. Poker is a popular game choice for many players at online casinos, but there are also sites that are strictly for those that enjoy poker. With online poker rooms, players will find a large variety of games that can be played for many different bet amounts. These sites are usually home to great paying tournaments and special events and it is even possible to play in satellite tournaments to gain entry to some of the greatest poker events around the world. With online poker rooms, players will enjoy competing against players at the same skill levels and there are always amazing games that can be enjoyed, offering endless action and many ways to generate real money payouts. Many poker rooms will advertise their services online, though they can only do this in areas where online gambling is legal. With online poker advertising, players can learn of different sites that offer a variety of games and they will also be able to find out about any current promotions that are being offered at those sites. Some poker rooms will join forces with online casinos and will allow players to use their casino accounts to gain access to the poker room as well. Poker rooms will also be advertised at gaming sites that offer casual games and they will be featured at gambling portals. Players will find many leading poker sites trying to attract players through advertising and some of these may even appear on television where gambling is legal. One way that a poker room will try to gain new players is by offering a bonus or a promotion that can offer free cash that can be used to place bets at the poker tables. There are many types of bonuses that can be enjoyed, but for new players, poker rooms often rely on no deposit bonuses to appeal to new players. With these bonuses, players will not have to make any financial commitment to the site. They can register and earn a small amount of free cash that can instantly be used on the games offered. In addition to no deposit bonuses, poker rooms will draw the attention of players by offering welcome bonuses. These are match bonuses that will add a percentage of money to the amount of the deposit, instantly boosting the account balance and offering players more money to use at the site. Each online poker room will have a different offering of bonus deals that can be used. Players will have to create an account to be able to take advantage of any of these offers and they can present free cash or free credits that can be used to place bets. The most popular form of a poker bonus is a no deposit offer. This is a perfect opportunity for new players to enjoy risk-free games of poker and win payouts. With these bonuses, no money is required to be deposited. The site will credit the account with money to use at poker tables and if players do not win, they are not obligated to remain at the site. However, if they do win and wish to withdraw these funds, they will have to complete a deposit and meet wagering requirements. Welcome bonuses are just as popular and these are perfect for new members at a site. Players will just have to make a qualifying deposit and the casino will credit them with a percentage match, immediately increasing the total balance in the account. Some other types of poker bonuses that can be found online include reload bonuses, which are similar to match bonuses, and cash back offers, providing a way to recoup some of the losses that are incurred while playing real money games at the site. Since there are many great poker rooms operating online, players will need to know the best sites that are worthy of promoting. The leading poker rooms will offer player protection and will always conduct transactions through encryption software. They will also be licensed and regulated. When it comes to player attraction, the site should offer the most popular variations of poker and should also allow players to place various bet amounts so that low, mid and high rollers can all enjoy the games. Finally, the best sites shod offer multiple bonuses and promotions that will always provide players with rewards for being loyal to the site and returning to enjoy the games that are featured. It is important for poker sites to provide a safe and secure environment with trusted software and a wide assortment of gaming options.